Fully diamond set 2 row, diamond eternity ring, holding 2 carats of round brilliant cut diamonds across a 4.85mm wide band. 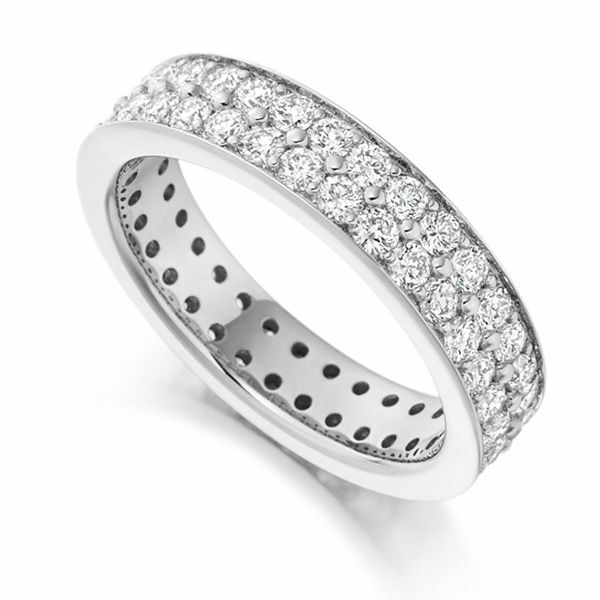 This beautiful Eternity Ring is fully set with ice white Diamonds. Each Diamond is precision set in a grain style over two rows to add maximum brilliance. The band benefits from a simple, comfort fit court shaped band 4.85mm wide. These Round Brilliant Diamonds have been hand graded and perfectly matched to F/G Colour, and VS Clarity prior to setting. Available in a wide range of precious metals including 18ct White Gold, 18ct Yellow Gold, 18ct Rose Gold, 950 Platinum, and 950 Palladium. Presented in our luxurious bespoke packaging, and delivered by insured courier in approximately 3-4 weeks.